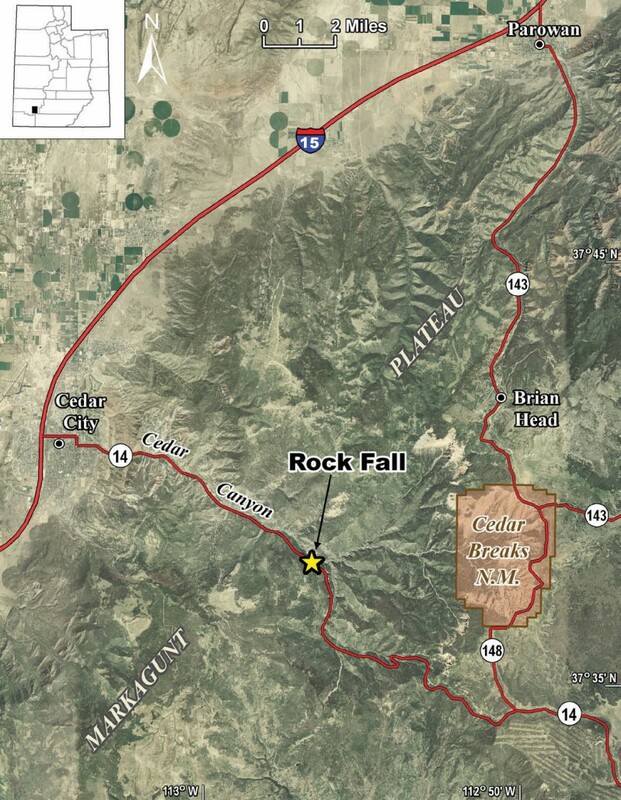 Rock-fall location along SR-14, 8 miles east of Cedar City, Utah. 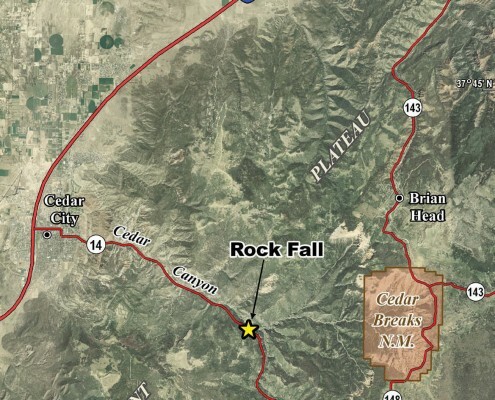 On Monday, January 5, 2009, at approximately 6:00 p.m., a large rock mass detached from a cliff on the south side of Cedar Canyon about 8 miles east of Cedar City, Utah. 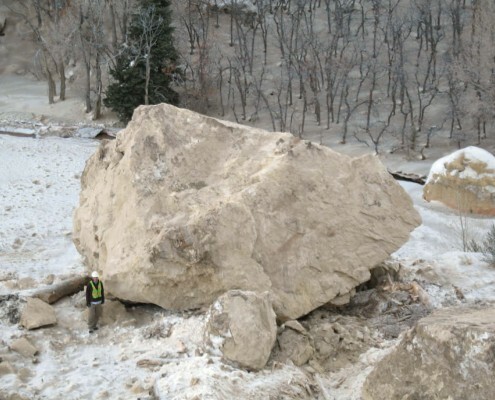 The rock mass fell, bounced, and rolled downslope while disintegrating into tens of individual large boulders and hundreds of smaller ones before burying an approximately 750-foot-long section of Utah State Route 14 (SR-14). SR-14 is an important transportation link between Interstate 15 at Cedar City and U.S. Highway 89 at Long Valley Junction to the east. The triggering mechanism for the event was likely recurring freezethaw cycles and ice wedging in bedrock joints. Fortunately, there were no motorists on the affected section of the highway when the rock fall occurred. 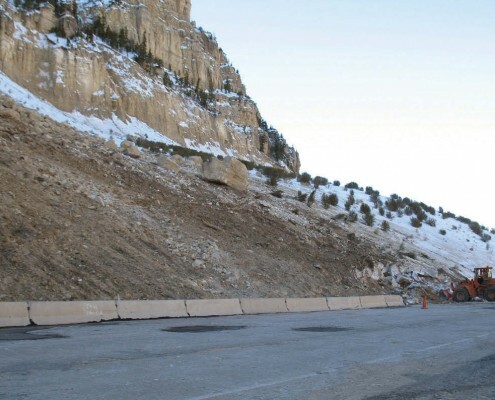 The Utah Department of Transportation (UDOT) estimated the rock-fall volume at 60,000 cubic yards. 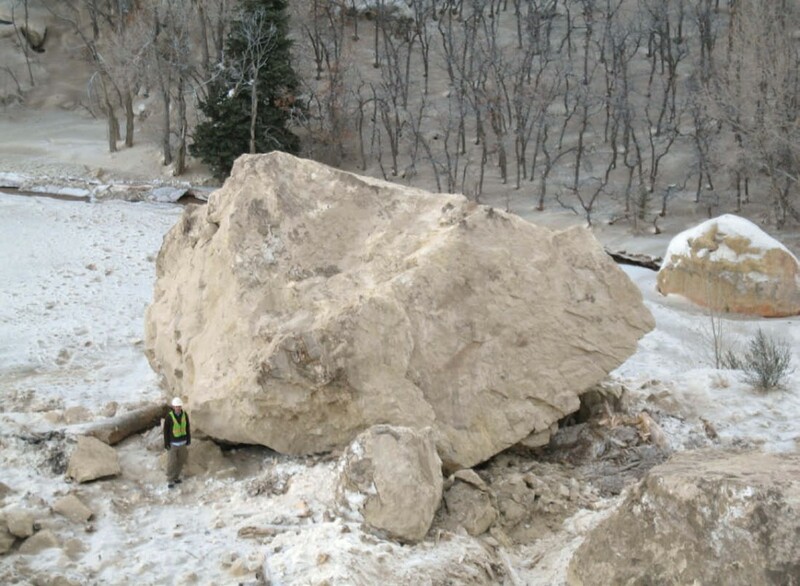 The largest boulder observed had dimensions of approximately 18 x 18 x 24 feet and weighed an estimated 600 tons. 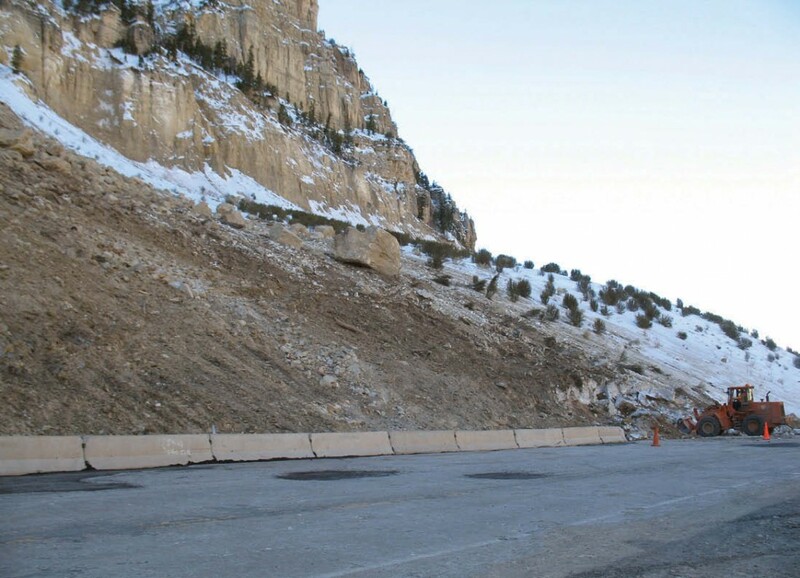 SR-14 remained closed while UDOT blasted the largest boulders, cleared the highway right-of-way with heavy equipment, and repaved the damaged road surface. Geologists from the Utah Geological Survey Southern Region Office inspected the rock fall on the morning of January 7, 2009, while UDOT cleanup activities were underway. Cedar Canyon incises the western margin of the Markagunt Plateau at the transition between the Basin and Range Province and Colorado Plateau. Deformed Mesozoic sedimentary strata in the transition zone are exposed in the lower several miles of the canyon; however, at the rock-fall site, the canyon is in the Colorado Plateau proper, and rock units there are largely undeformed, dipping a few degrees to the east. The stratigraphic section at the rock-fall site includes the cliffforming Tibbet Canyon Member of the Straight Cliffs Formation, which sourced the rock fall, and the underlying slopeforming Tropic Shale and Dakota Formation, all Cretaceous in age. The 600-foot-thick Tibbet Canyon Member is chiefly fine- to coarse-grained, limey sandstone; the 30-foot-thick Tropic Shale is sandy mudstone and muddy sandstone; and the greater than 600-foot-thick Dakota Formation is chiefly interbedded mudstone and sandy mudstone with thin sandstone horizons. About a half mile west of the rock fall, SR-14 leaves the bottom of Cedar Canyon and begins climbing the steep, south canyon wall toward the top of the Markagunt Plateau. The Tropic Shale and Dakota Formation are exposed in the lower part of the canyon wall and are susceptible to landsliding. At the rock-fall location, SR-14 crosses a large rotational landslide, which has been intermittently active for many years and has frequently damaged the roadway. 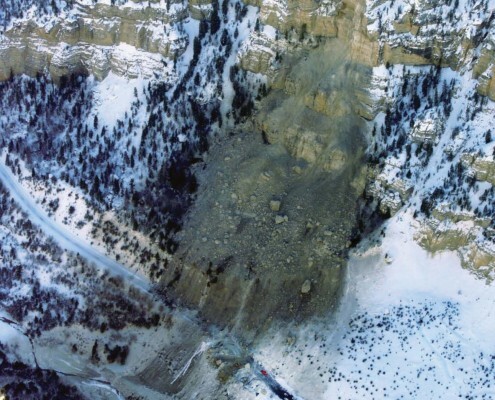 The rock fall detached from the overlying Tibbet Canyon cliff and fell onto the landslide below. 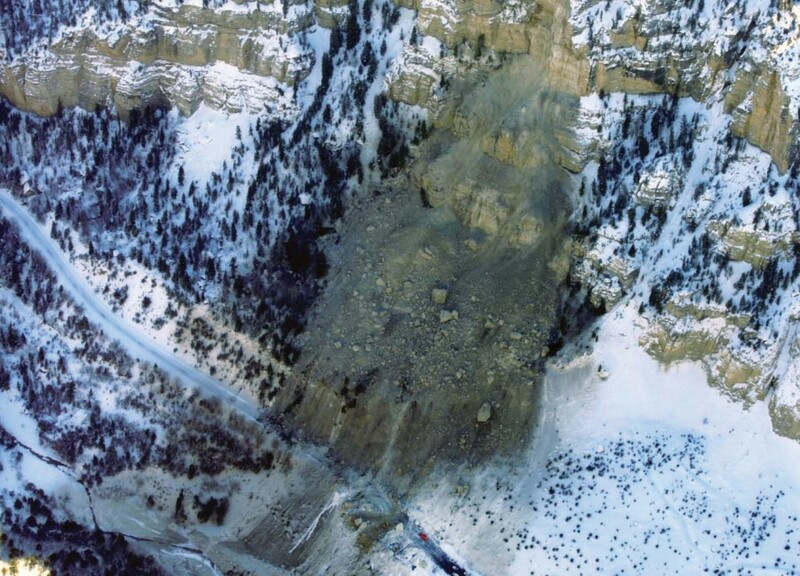 Examination of the site showed no evidence of renewed movement of the landslide either prior to or following the rock fall when the landslide surface was suddenly loaded with the weight of the fallen rock. The University of Utah Seismograph Stations (UUSS) recorded a magnitude 1.7 earthquake on January 5 at 6:04 p.m. in Cedar Canyon—11 minutes before the Iron County Sheriff’s dispatch received notification of the rock fall from a passing motorist who backtracked 3 miles to make the phone call. UUSS stated that this earthquake may have been triggered by the rock fall. The seismic waveforms are atypical for a local tectonic earthquake (emergent compressional-wave arrivals and the absence of clear shear-wave arrivals), and large depth uncertainty allows for a surface origin. A final determination of the source of the earthquake will require further study. However, because of the small size of the earthquake, the available data are of marginal quality. 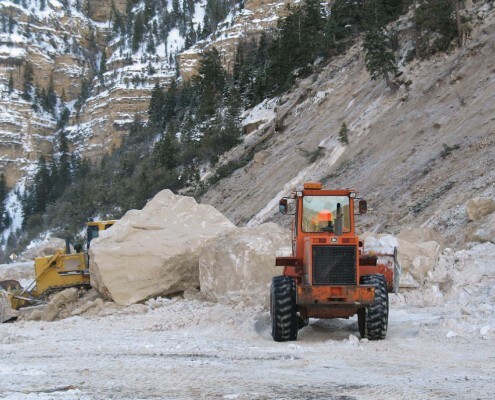 Other than earthquake timing, the only other constraints on timing of the rock fall are a UDOT snowplow that passed through the area at 5:30 p.m. prior to the event and the 911 call received at 6:15 p.m. following the event. 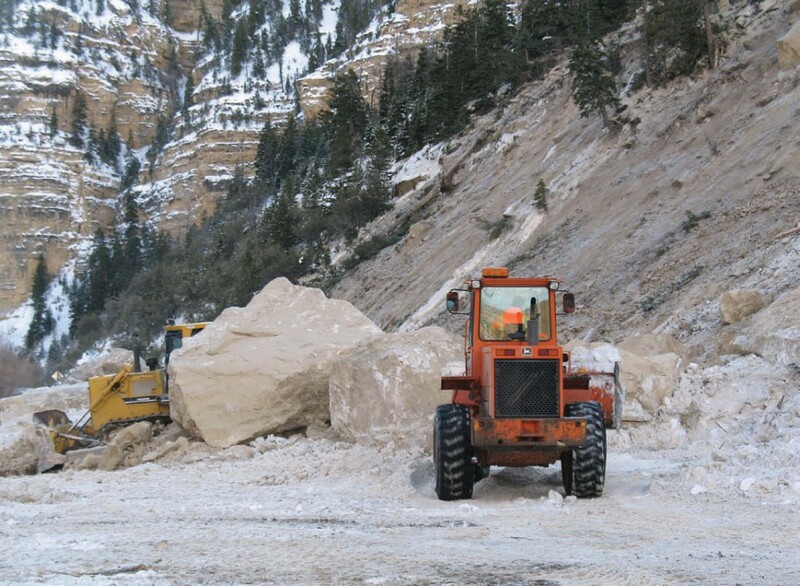 UDOT immediately began clearing and repair of SR-14. Originally estimated to require two weeks of work, UDOT reopened SR-14 six days after the event. In addition to clearing and repairing the roadway, remedial work included installation of concrete Jersey barriers to reduce the potential for boulders remaining on the slope above the road to reach the roadway in the future. UDOT plans further remedial work to reduce the rock-fall hazard from large boulders remaining on the slope above the highway.